Pasta in tomato sauce is a perfect no fuss supper. It takes very little time to prepare and when done well can be one of life's simple pleasures. 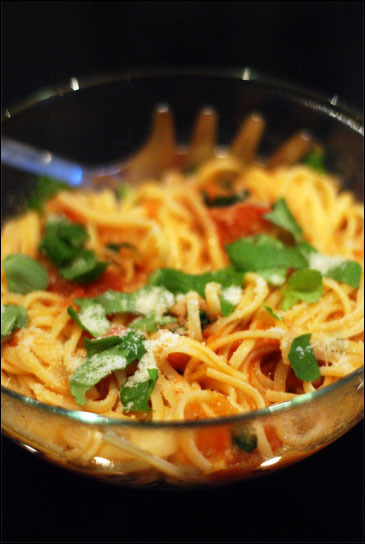 I have made this version with fresh tomatoes as opposed to tinned for optimum flavour. It takes a little more effort to prepare, but for the difference in taste you will be handsomely rewarded. Use the most flavoursome tomatoes you can find, otherwise add a teaspoon of tomato puree to boost the flavour. Finely chop the onions and fry until soft in olive oil. While the onions are frying, boil the kettle and immerse the tomatoes in a bowl, making sure they are covered with boiling water. Leave to sit for about a minute and a half, then peel off the skin from each tomato (this is extremely satisfying!) and set aside. Once you have peeled all the tomatoes, chop them into quarters, taking care to remove the woody stem at the top. Add the garlic to the soft onion and fry for a minute before adding the chopped tomatoes. Turn the heat down really low and simmer with the lid on for 5 minutes to keep in all the moisture. Stir the tomatoes gently to break them apart, then add the wine and a squeeze of lemon juice. Simmer for a further 20 minutes, stirring occasionally. If the sauce starts to stick to the pan, just add a couple of tablespoons of water. Season with salt and pepper to taste. Put the pasta on to boil - I used linguini, but it is lovely with penne or spaghetti too. When the pasta is still slightly al dente, drain and stir in the tomato sauce, the basil (reserving two or three leaves for garnish) and most of the parmesan (again, keep aside a little to sprinkle on top at the end). Transfer into a serving bowl, garnish, and enjoy with a glass of chilled white wine.